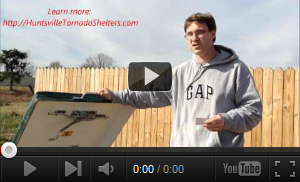 Welcome to Huntsville Tornado Shelters.com! Our aim is to provide you with all the information you need to be an educated and informed storm shelter consumer so you can make the right decision based on the needs of you and your family to keep them safe during severe weather. We appreciate you! >> We proudly offer the only Underground Storm Shelter that includes a limited LIFETIME Warranty, the Lifesaver Storm Shelter! >> Get our New *Exclusive* Severe Weather Guide App FREE for your iPad or Tablet + One-year FREE of Weather Call @Home – the indispensable address-specific, pinpoint weather alert service that automatically texts, emails and calls you when YOUR HOME or BUSINESS is in danger from approaching Severe Weather (so you know when you need to go!) to keep you and your family safe- FREE! You can find pricing information and ordering instructions by clicking here. We hope you’ll find all the resources, links, photos, videos and information you need all here on this one website. We also invite you to come see our shelters in person so you can touch and feel them to be certain you’re making the right decision. Do you ship to uk ??! Will, that would be pricey, but send me an email via the CONTACT US link with more information as to what you’re looking for and I can see if that would be possible. Thanks. want one how do i get financing for this? i live in greenville, sc. David, we have financing available as low as 2.99%. Give us a call at 256-258-9463 and we can put you in touch with our financing department or send me an email via the CONTACT US link. Thanks! Yes, Kay we do have financing available from as low as 2.99%. Give us a call at 256-258-9463 or send us an email by clicking on the CONTACT US link above for details. Thanks! I’m puertorrican, we are a 100 x 35 miles island with a 60% population living near tsunami risk coasts and the whole island under hurricane, storms and bad weather year round. There is a big market for your product here and no body is taking it seriously. We have a lot of companies selling security for doors, windows, etc., but no body cares about tsunamis and sudden floods. I believe in your product and I’m really positive about your company succsess if expanding to our island. If you are interested in expanding your company toward the Caribbean, just let talk. I’m interested in a above ground safe room, probably just a small one since i live alone. I would like to see if it could be added to my garage. Thank you!